By accessing, browsing and/or using this web site, you acknowledge that you have read, understood, and agree to these terms and conditions. If you do not agree to the specified terms and conditions, we suggest you not to use this website. Any/all information on this website may be changed or updated without notice. This website may contain copyright information which cannot be re-produced by you without the prior written approval from Hotel Apano Rajasthan. 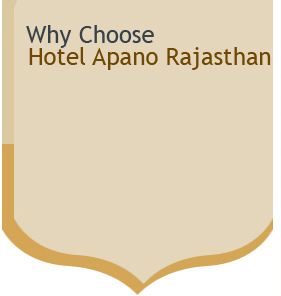 By giving information, Hotel Apano Rajasthan does not grant any licenses to any copyrights or any other intellectual property rights. Hotel Apano Rajasthan assumes no responsibility regarding the accuracy and use of such information is at the recipient's own risk. Any information or material sent to Hotel Apano Rajasthan through this website will be deemed NOT to be confidential. By sending Hotel Apano Rajasthan any information or material, you grant Hotel Apano Rajasthan an unrestricted, irrevocable license to use, reproduce, display, perform, modify, transmit and distribute those materials or information, and you also agree that Hotel Apano Rajasthan is free to use any ideas, concepts, know-how or techniques that you send us for any purpose. Hotel Apano Rajasthan makes no representations whatsoever about any other website which may be linked from this website. A link to a non- Hotel Apano Rajasthan,Web site does not mean that Hotel Apano Rajasthan endorses or accepts any responsibility for the content, or the use, of such Web site. It is up to you to take precautions to ensure that whatever you select for your use is free of such items as viruses, worms, Trojan horses and other items of a destructive nature. When you access a non- Hotel Apano Rajasthan Web site, even one that may contain our name / logo, please understand that it is independent from Hotel Apano Rajasthan has no control over the content on that Web site. In no event will Hotel Apano Rajasthan be liable to any party for any direct, indirect, special or other consequential damages for any use of this web site, or on any other hyper linked website, including, without limitation, any lost profits, business interruption, loss of programs or other data on your information handling system or otherwise, even if we are expressly advised of the possibility of such damages. 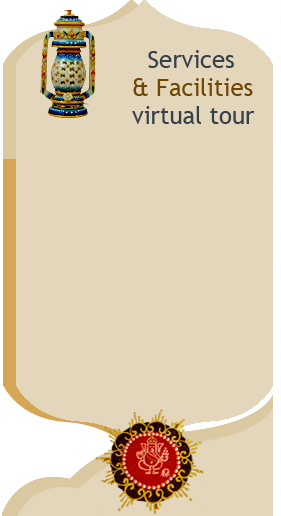 By accessing this website, you acknowledge that any reliance upon any material or information provided on this website shall be at your sole risk.Hotel Apano Rajasthan reserves the right in its sole discretion and without any obligation or explanation, to make changes, correct or delete any presented information / document / picture / material without prior notice.